Hi all – gosh, March already! 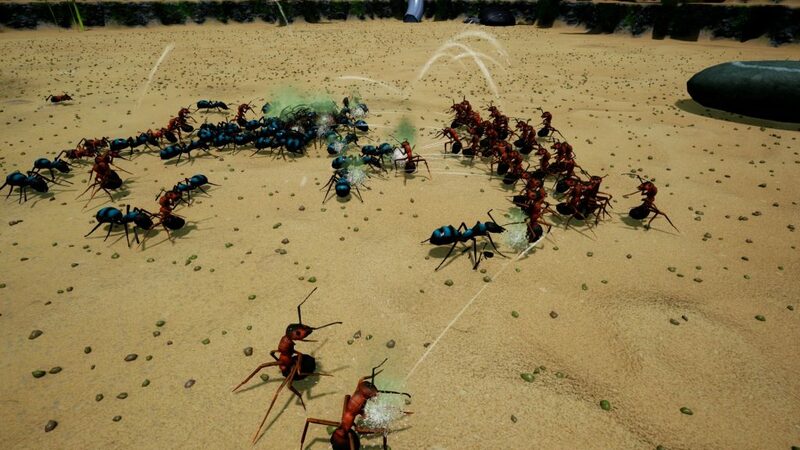 Time flies when you’re having fun – and for that reason it certainly flies when you’re developing a game about ants. We’ve recently been assessing the way we tell you all about the future of the project, and we realize there’s a deep need for us to communicate better – as we posted in a mini-update a couple of weeks ago. 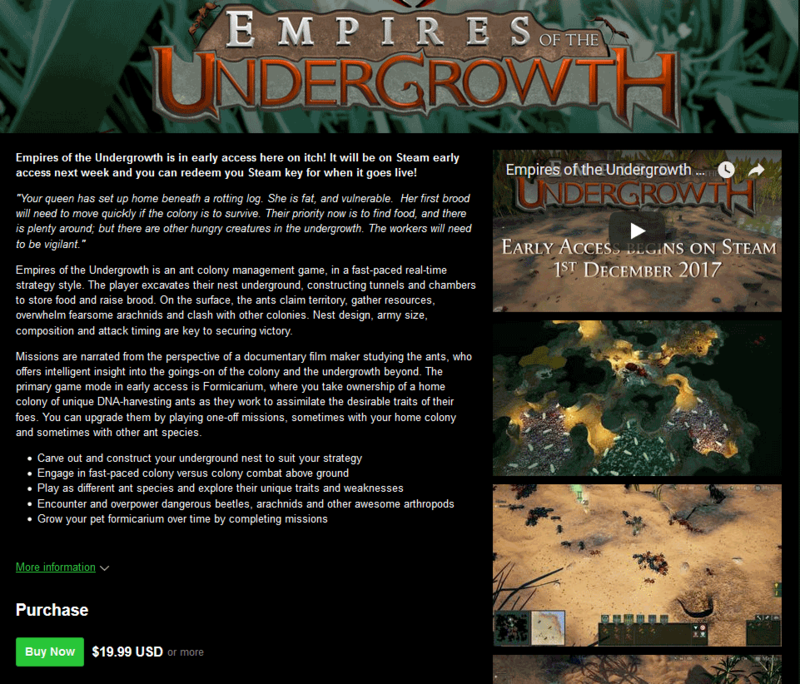 Although we have been developing Empires of the Undergrowth for several years, we only launched on Steam in December and therefore we’re new to having a big community that we have responsibilities to. We want you guys to feel justifiably assured that things are progressing well (as they are) – and for this reason we’re going to be doing our best to communicate here. We’ve been doing these newsletters for some time – but this is the first time we’ve worked out that we can actually post them properly formatted to Steam, rather than just a link to elsewhere. Always learning. We’re certain that we don’t want to rush – and that’s always been the case. Our modus operandi has been quality first – ultimately, we’re making our dream game here and we want it to be great just as much as you do. Given our limited resources (our team size is 3) we’ve made decisions – like not releasing small, incremental updates and instead focusing on the bigger picture with larger updates. That’s because the whole process of an update is a drain of resources and time. In a larger team or for a game of lesser scope, this might be doable. We feel we’re in the right place here. With that clarified, due to many understandable requests, we’ve made what is often referred to by makers of early access products as a “road map”. A road map refers to a rough outline of how a developer intends their project to progress. It’s usually an abridged version of the internal plan the developer has, as it is in our case. This is ours for the remainder of 2018. You’ll notice that it’s rather vague – this is deliberate; as we’ll talk about later in the newsletter – software development is so unpredictable that even the most seasoned veterans have real difficulty in pinning down exact release dates. 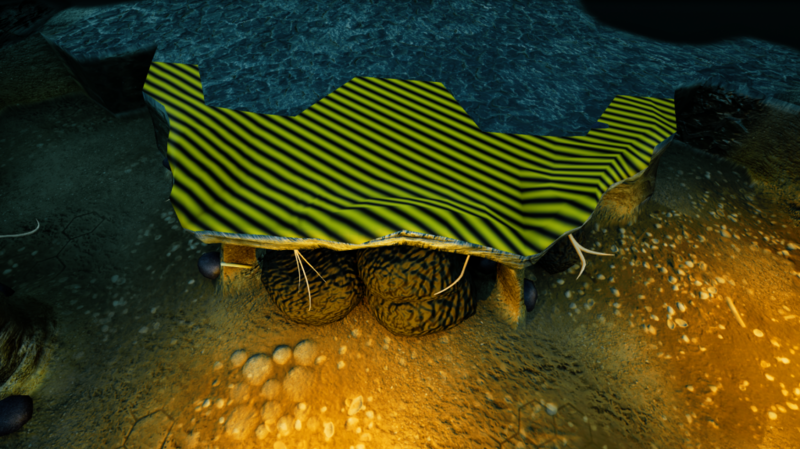 However, you can see that we plan on releasing the third tier of the Formicarium in the summer (Major Update 1), and the Freeplay mode before that. All of this, by necessity, comes with the caveat that it’s subject to change. John, after moving house, has been continuing his work on Freeplay mode. He’s recently been working on the vast amount of options that the mode will allow – the difficulty slider will feed in to many different things that affect how the game will play. 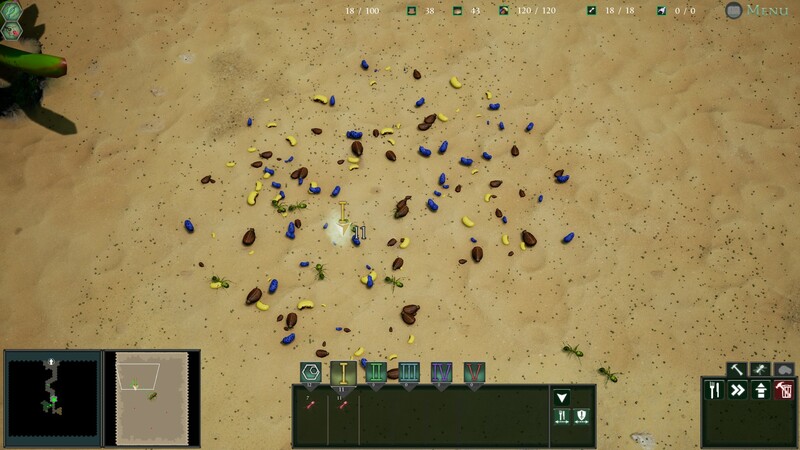 In this stream recorded in February, you can see him tweaking things such as creature temperament, and connecting all the disparate systems that need to work in harmony in order for this game mode to become a reality. It’s clear from the complexity of Freeplay that a lot of its enjoyment factor will come down to the setting of parameters – and for this reason it’s definitely going to be a mode that will be balanced and tweaked extensively. We’re going to need your feedback on that one – and that brings us to the matter of when we release it. As mentioned earlier (and is discussed more extensively below) deciding on an exact release date in this line of work is folly until you’re sure – and even giving vague guesstimates is usually pointless. The best we can give on this is “a few weeks”. We hope you guys understand why. John is continuing his streaming after a short break for the aforementioned house move – it’s usually on a Thursday afternoon, Greenwich mean time. For now, John is working the notice on his day job and that will continue until the Easter break. 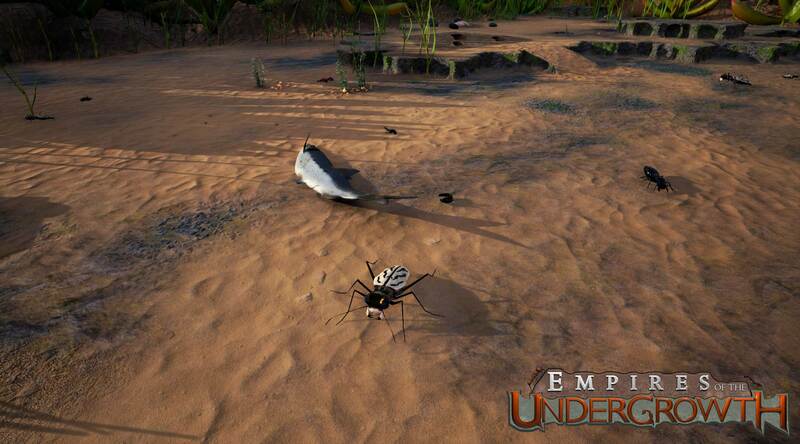 After that, he’s a bona fide full-time Empires of the Undergrowth developer and the streams are likely to become more scheduled and regular. A landmark occupied by aphids – landmarks can take a wide variety of forms. 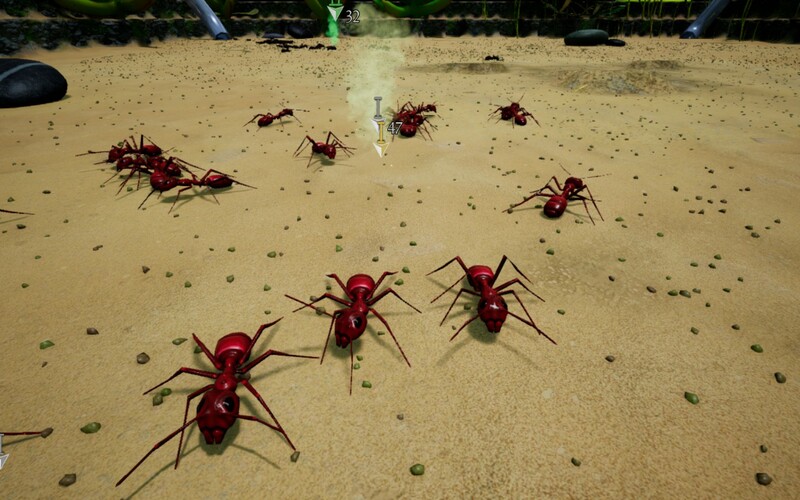 As previously announced, the next species of ant added to the game will be Atta cephalotes – a South American leaf cutter ant. 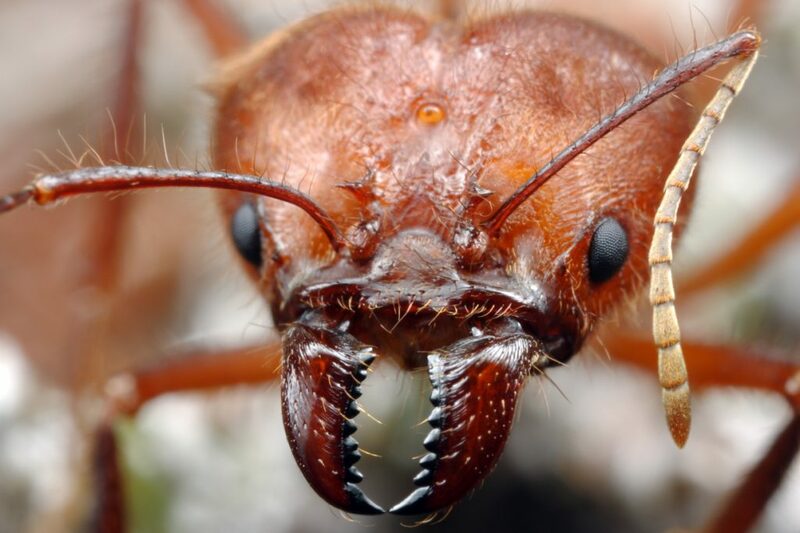 These ants don’t eat meat – although they can give you a particularly nasty defensive nip with those huge mandibles, they’re in it purely for the leaves. The colony forms distinct trails as it searches for suitable leaves, before cutting them down in a variety of ways and transporting them back to the nest. 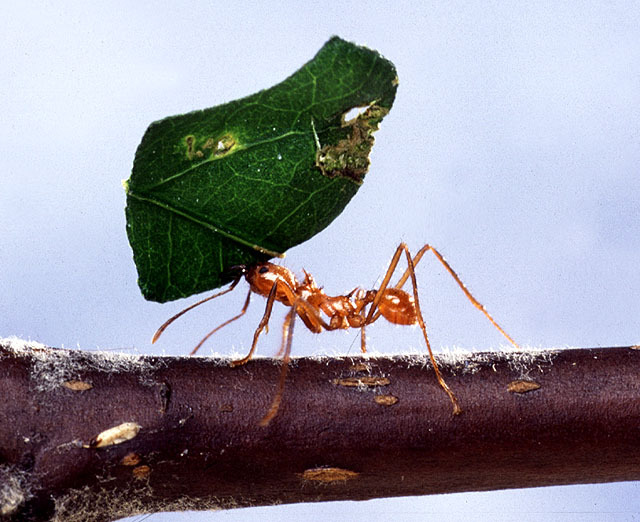 Here, the leaves decompose due to a mutual relationship the ants have with a special kind of fungus – and it is the fungal growth itself that the ants feed upon. 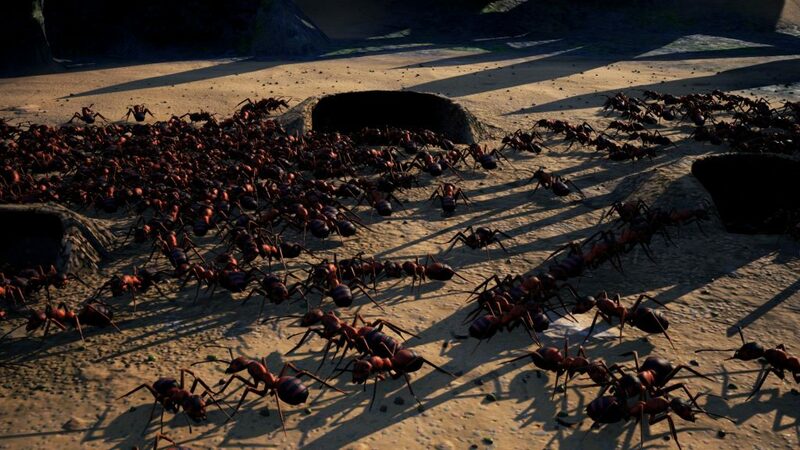 Although we’ve had a bit of variation of sizes between ants before (between workers, soldiers and upgraded ants) that’s just peanuts to leaf cutters. Atta cephalotes is a very distinctly polymorphic species – meaning it has within it several “castes” of ant that exhibit obviously different traits. The “minors” are undeniably tiny compared to the “majors” – which can be several times as long and more than 100 times the mass of the minors. They have unusually-shaped heads that house the huge muscles needed to power their slicing jaws. There is also an intermediate “medium” caste. An Atta cephalotes major, giant mandibles and head muscles visible. Photo by Alex Wild. In our game, the majors will certainly be formidable in combat – huge, imposing and a target for enemies (we will be introducing a “taunt” mechanic that makes enemies want to attack them preferentially). However, all 3 of the castes will be intrinsically involved in what leaf cutters do best – cutting leaves. Each one will have a distinct role that, when used efficiently, will speed up production of your colony-sustaining fungus. We don’t want to spoil it too much, so we’ll leave it there for now! So, a bit of self-reflection and commentary on development as a whole for this section of the newsletter. “When it’s done” has become a meme relating to game development for good reason. We suddenly have a large audience – and with that comes expectations. That’s been a bit daunting but we’d like to think we’re learning quickly from the experience. Delays are frustrating for both developers and consumers. It’s a considerable risk to even give an estimate of when a feature or product will be ready without total certainty. 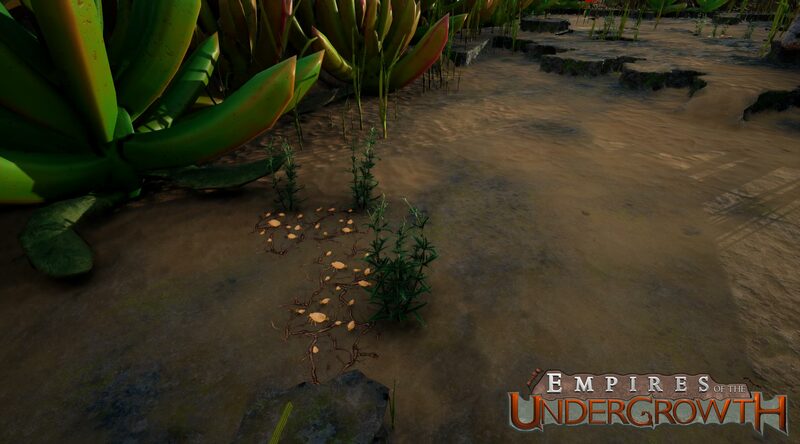 A recent example that unexpectedness for us is the way that we’ve been decorating our levels – the Unreal Engine that powers our game has changed in such a way that the method we were using is no longer viable. So, Matt has been working on a custom plugin to help him do the artwork – as a necessity, but it’s a drain on time we couldn’t have predicted before it happened. On the plus side, in this case – the new method comes with a performance boost. In 2015 we failed our first Kickstarter – and took a philosophical approach to our failings. We’re always learning. Communication is key – from the point of view of our small team of 3 developers and 1 social media guy, 3 months is not a long time between updates – however, in the eyes of the consumer who is used to quick patches for their games, it sets off alarm bells that the game is abandoned (we’ve heard that word used more than once in concerned forum posts). This isn’t the case – we’re just a smaller team and things are going to take time to be done properly. We don’t have the resources of the team behind the excellent Factorio, for example. In a small way the early access model doesn’t help these concerns – people know they are paying for an incomplete product and therefore have to have some faith that the investment they’re making now will be returned by a great complete product. We’d just like to assure you all that things are progressing well, and the deep transitional phase that Slug Disco is currently undergoing will soon be finished. 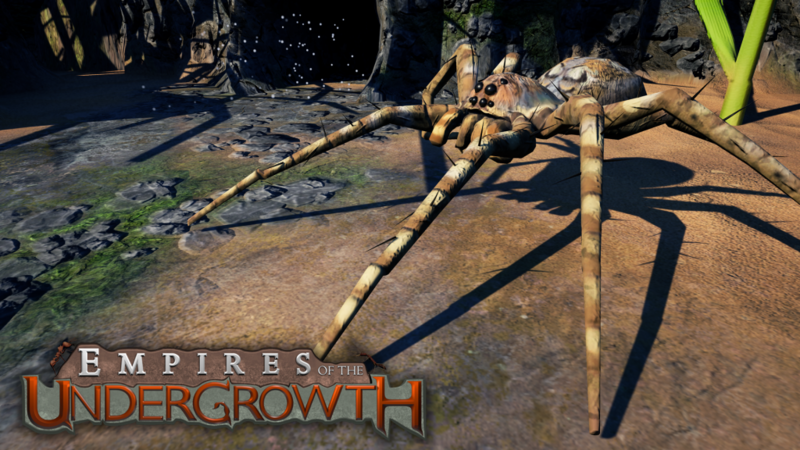 Once is it, we’ll have 3 full-time developers working on Empires of the Undergrowth. 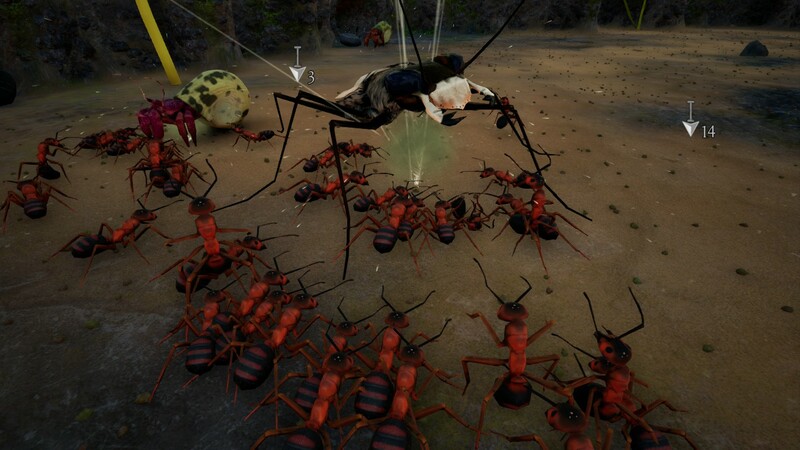 We like to trawl through the Steam screenshots of EotU every so often. Here’s a few of our favorites from the past few weeks! To get some great screenshots yourself press F9 (by default) in-game to enter Photo Mode. 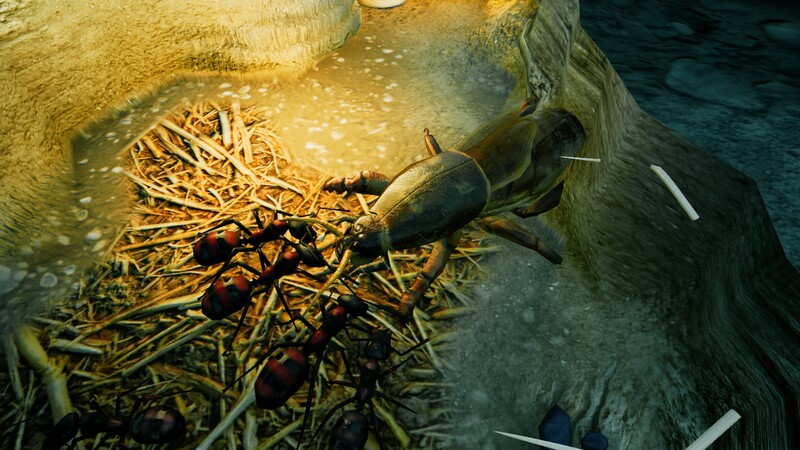 Hi ant fans! We’re increasingly hearing complaints that we’re not being communicative enough. We do our best – but we’re new to this, so we’re always learning. This isn’t going to be a full newsletter (that will likely come next week) but just a bit of a round-up of what we’re up to currently. We’ve heard a lot of people fearing that the project is abandoned or in trouble due to a lack of updates – far from it! In fact that the game has been successful enough on Steam that all 3 of our developers have been able to quit their day jobs and will soon (but not yet) be working full time on the game! Given the small size of the team we prefer to release larger, more complete updates rather than lots of smaller ones. Every time we update development is slowed for the testing and compiling processes – so you can see why this is our preferred model. All 3 of our developers will, from April, be working full-time on the project. Naturally the pace of work will speed up then, but please be aware that 2 of the 3 are still working their day jobs up until then. So please welcome John and Liam, the newest full-time Slug Disco employees! Thanks to Exquisite Bolagnese for this screenshot! We’d hoped to get Freeplay mode out to you in February, but that is unlikely now and it’s looking more like March. These things happen all the time in game development (as I’m sure you’re aware – even the really big developers have trouble pinning down release dates for features) and although it’s frustrating we’re not going to give you something we feel isn’t fun and worth playing. 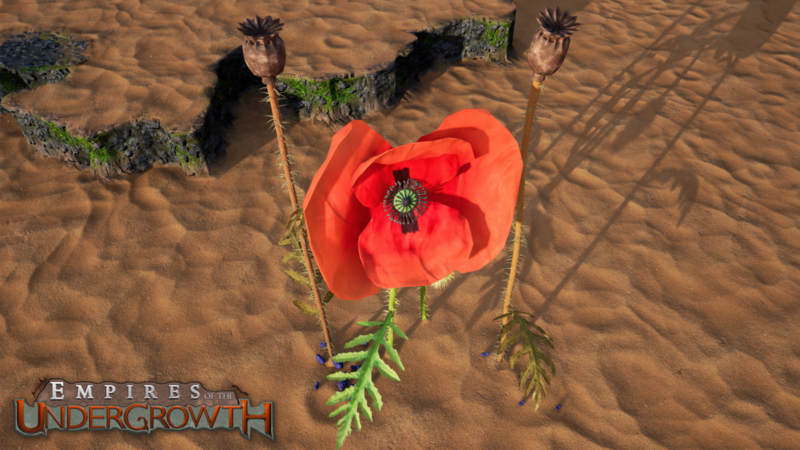 We are doing some new stuff for Freeplay – check out this poppy head model! This is one of several “landmarks” that can appear in a Freeplay map – the landmarks will take random forms on loading. 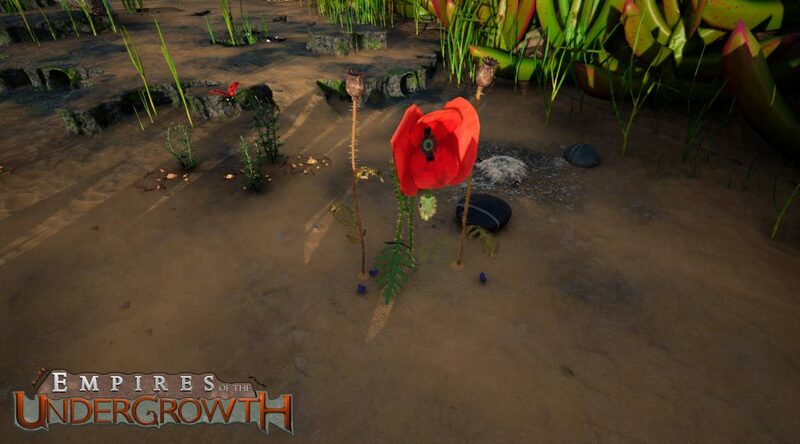 The poppy heads will drop seeds for your ants, giving you a regular food supply – but free food won’t go unnoticed. We’ve recently finalized our plans for the third formicarium tier – which will feature leaf cutter ants (Atta cephalotes). 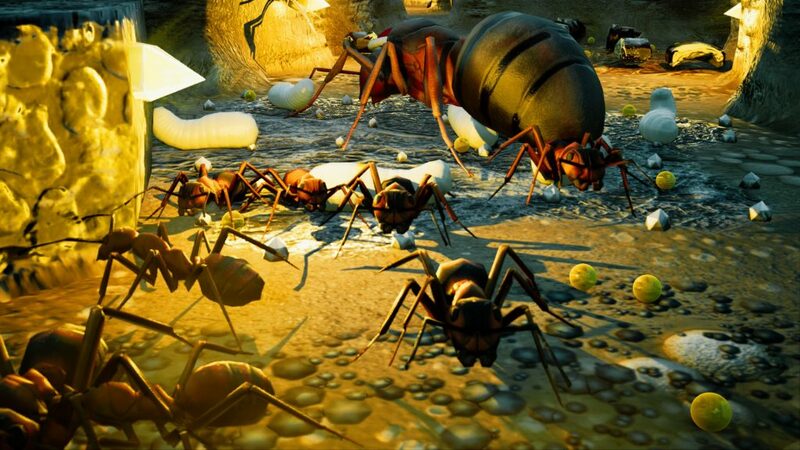 The mechanics they’ll use to harvest leaves for food will be integrated closely with the different castes that exist in their society – which includes really huge Major ants, as well as Medium and Minor castes. We’re excited to be adding some more complexity to the game mechanics in the levels going forward. And finally, we’re working on the challenge mode for 2.1 and 2.2. 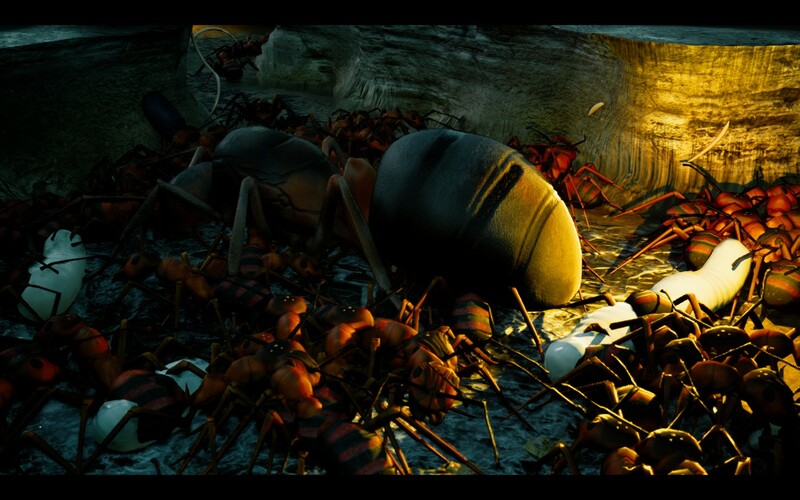 “Ant” and “lion” should rarely be uttered in the same sentence, let alone the same word! A new year dawns. It feels like Empires of the Undergrowth has been out for at least a decade now. It’s been just under six weeks! A very happy new year to all of you – let’s talk about our plans in the context of 2018 and how well the game has been doing. In short, it’s done way better than we’d dared to hope and given the small size of our team, that has some quite profound implications. On to it! 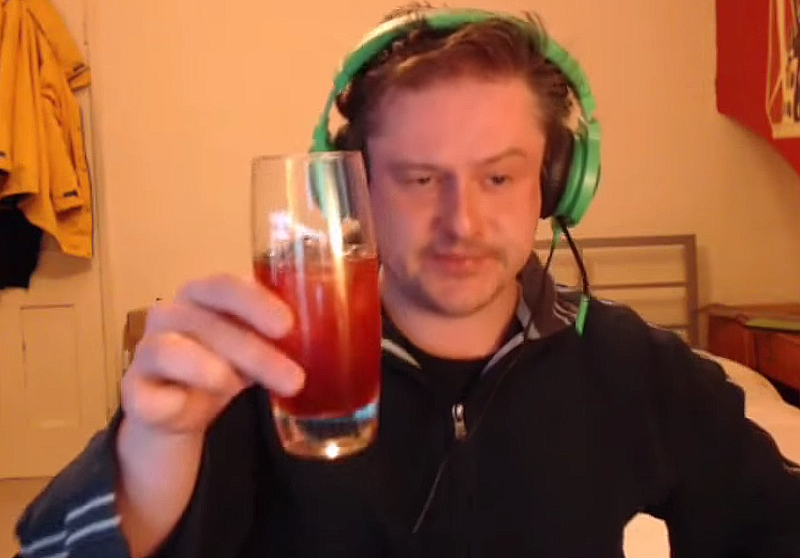 The best news for the project itself is that the game has done well enough to secure Matt for the foreseeable future and open up space for John to join him as a full-time Slug Disco developer. Up until now we’ve only had Matt full time on the game since that was all our crowd funding allowed for – John and Liam have been working in their spare time. Thanks to the amazing support from you guys, we can look forward to increasing the pace of the project once notices have been worked at current day jobs. 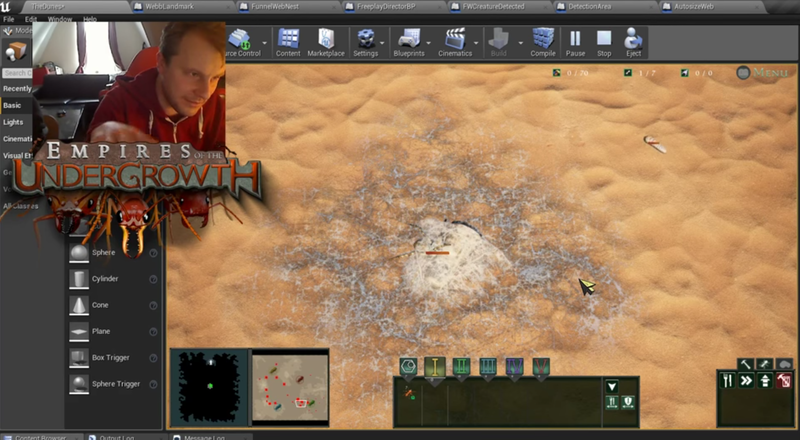 During the last month John has done a few live-streams of development for the upcoming Freeplay mode. 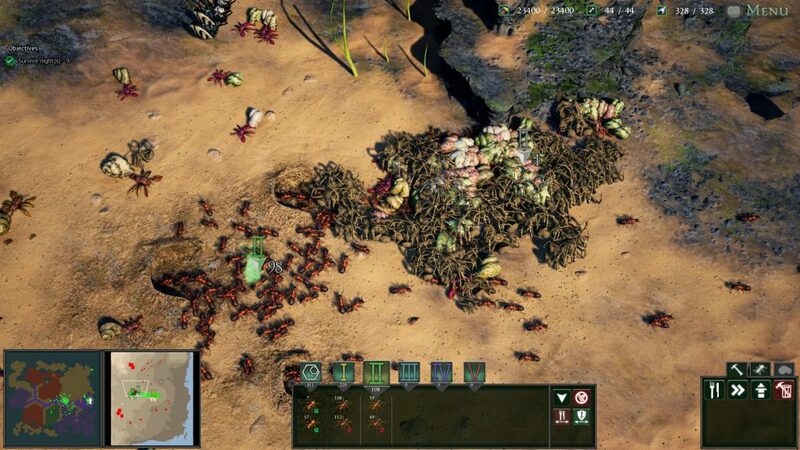 In this endless game mode, your colony will grow at a slower pace than the missions as you deal with threats from creatures, the environment and the weather. 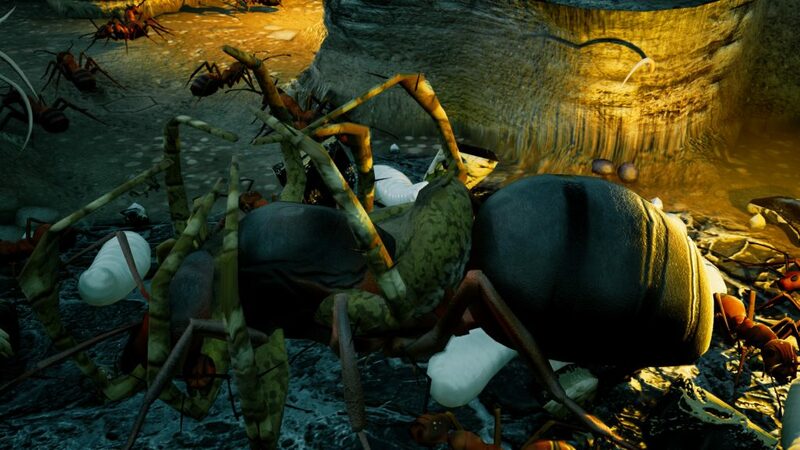 The idea is to set up initial conditions to the player’s choice, such as – what species do you want to play as? At what pace would you like threats to ramp up? Would you like super-tough enemies to appear every so often? 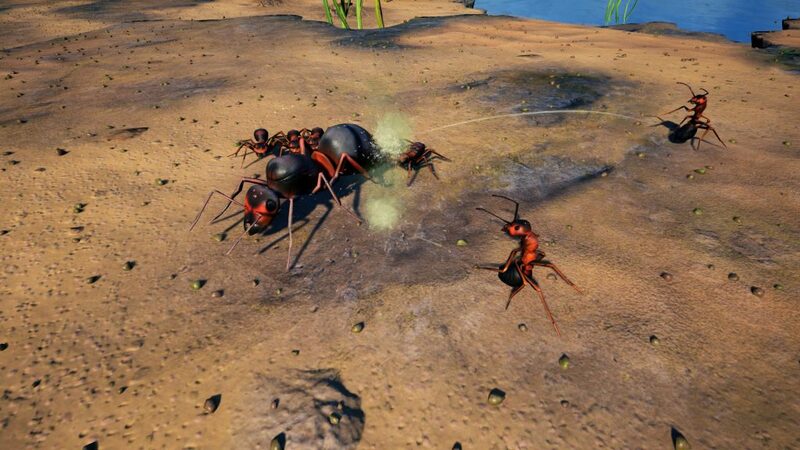 The game will be saveable so that you can come back to your colony and play with it for a while. For now John’s live streams are unscheduled due to his day job, but in a couple of months there’s the opportunity for them to become much more regular when he goes full time on the project. For now – keep an eye on our social media for details of when John is going live. John wants Freeplay to be a community-driven project, so he encourages maximum involvement with his live-streams! Although we liked the padlock symbol and its progress bar-like feature, ultimately too many players thought the padlock meant the surface was locked and inaccessible – which in hindsight is obvious. Curse you, hindsight! The new system makes digging out the nest entrance feel more like regular digging. Players found themselves having to make permanent choices for abilities without informed feedback of what they were deciding against. This change allows the abilities to be swapped, albeit at the full royal jelly cost so the initial decision still has some gravity to it. 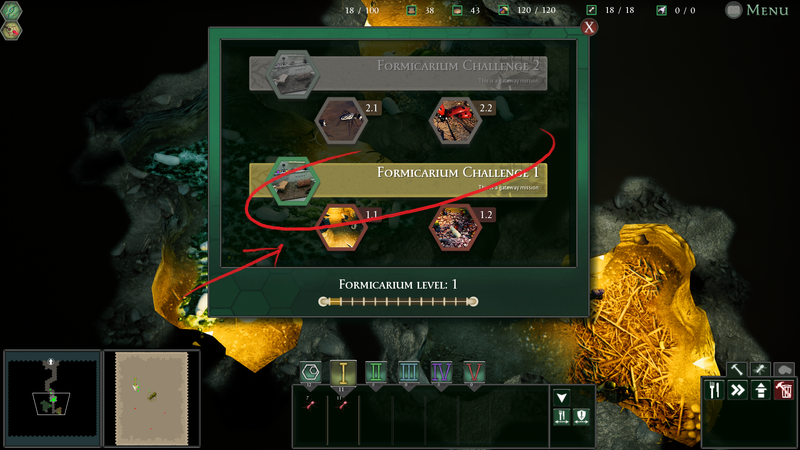 Too many players were assuming the buttons to launch the Formicarium challenges (which are required to move on to the next level) were simply headers for the missions below them. We’ve reworked the buttons to hopefully make it more obvious that they need to be pressed, but there’s likely more we can do here. Don’t worry – I added the red in MS Paint! A common complaint was food rewards. Unlike royal jelly and territory, food is a physical entity that must exist in the world, and so when the Formicarium colony is granted a food reward it is deposited on the surface to be collected. Combined with the above confusion about the padlocked nest entrance, this led to many players thinking their food rewards were not granted. A text alert is now given to help assuage this. See? There’s loads of food up there! There are many reasons we’ve put a little time into this – who wouldn’t want a better candid snap of their queen? By default, press F9 to enter Photo Mode. Matt’s artwork for the game is incredible and finished to a much higher fidelity than is strictly necessary for a top-down RTS game but Photo Mode allows you to pause the game, move the camera into a much less restricted position then snap away. We’ve been really enjoying the community’s experimentation with this feature and it’s produced some stunning results. Below is a small selection of some of our favorites. Submit your snaps on Steam! We spoke about this in the previous newsletter and not much has changed, but it’s worth reiterating here. Whilst John is working diligently to get the basic form of his Freeplay mode out to you guys, the next set of Formicarium missions are being designed, scripted and implemented. The next species of ant you will play as will be a species of leaf cutter – specifically Atta cephalotes. 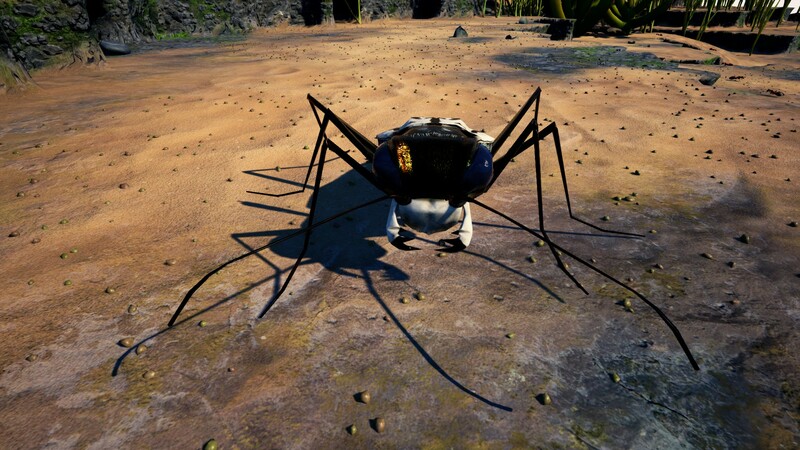 We’re deep into the design of this species, and it promises to be an exciting addition to the campaign. 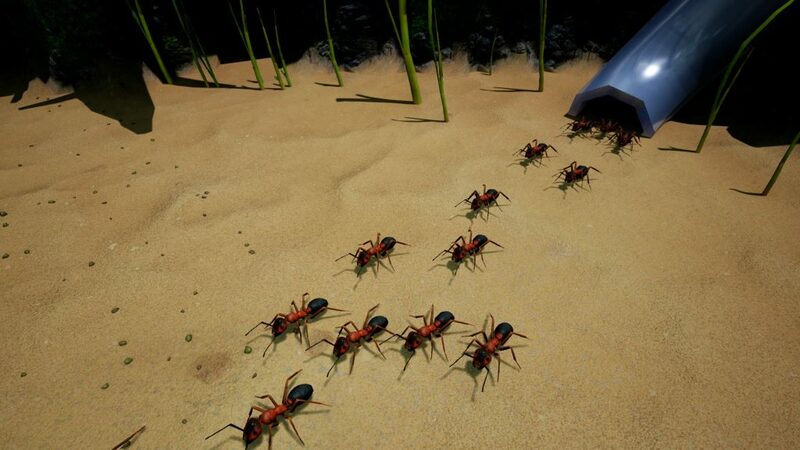 Whilst we’ve taken artistic license in giving our Formica species distinct roles when in fact their colonies are relatively homogeneous, we can be a little closer to reality here as Atta cephalotes has specialized castes in its society. 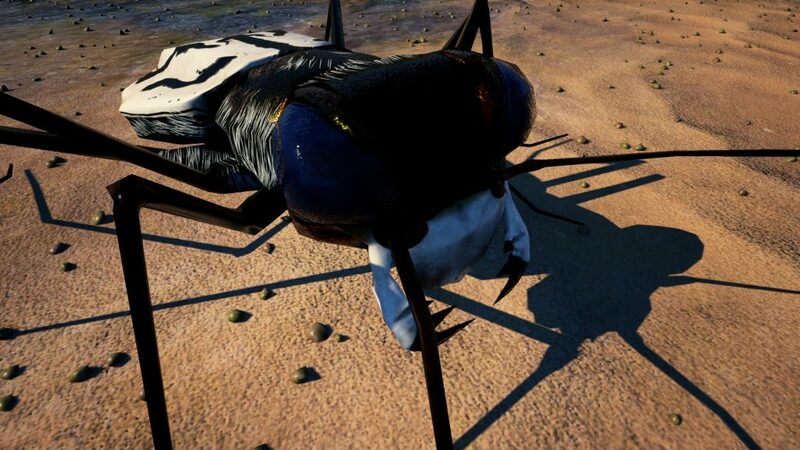 For simple time restriction reasons, all of the levels in the game so far have been set in the beach environment. 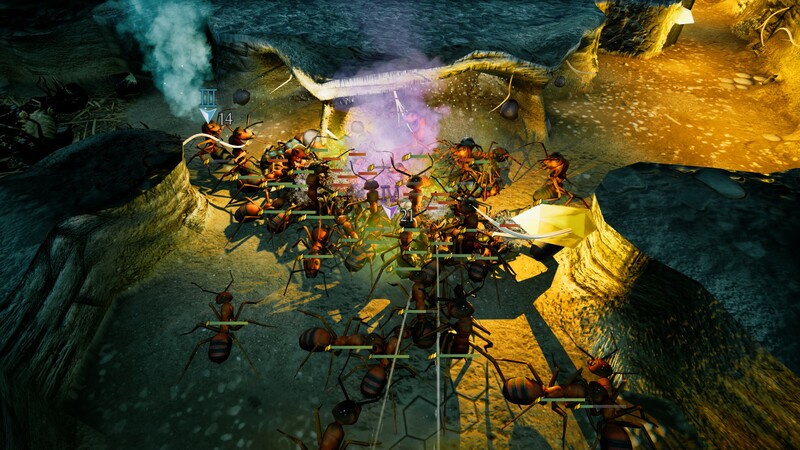 As we continue to expand the Formicarium campaign, different art assets will be required – and leaf cutters are jungle ants. 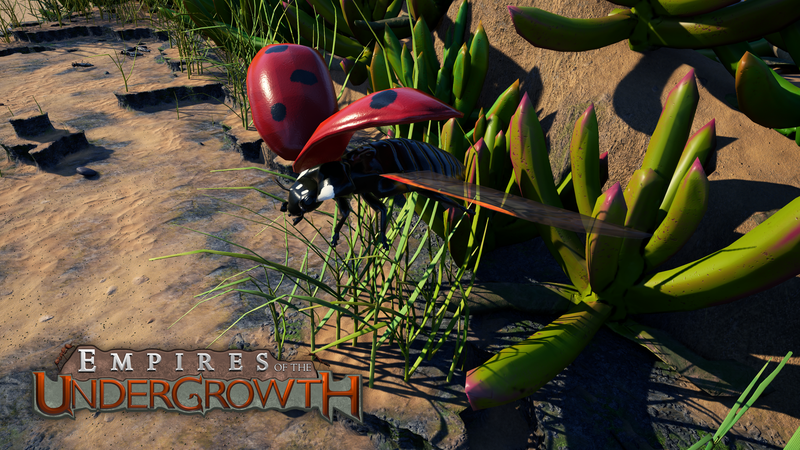 Matt certainly has his work cut out for him in creating new tile sets, new flora, and ultimately new fauna to populate these rain forest environments. 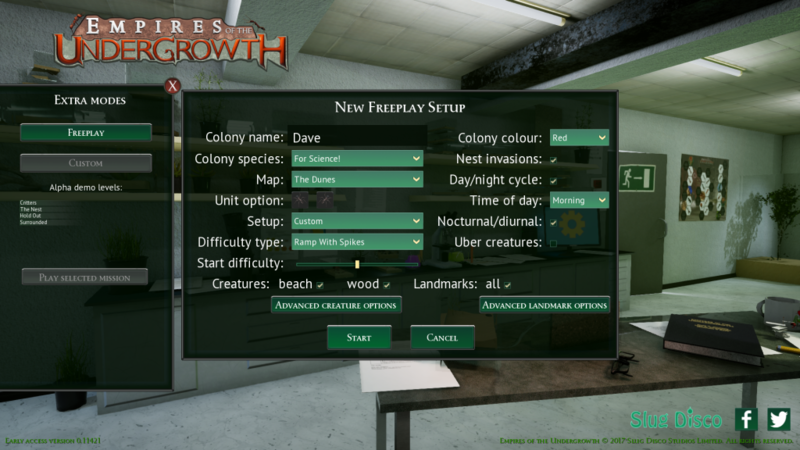 Expect the basic Freeplay mode to be the next major content update – it does not contain any spoilers for the Formicarium campaign (so we can be much more open with it) and as previously noted, John wants it to be a community-driven project. 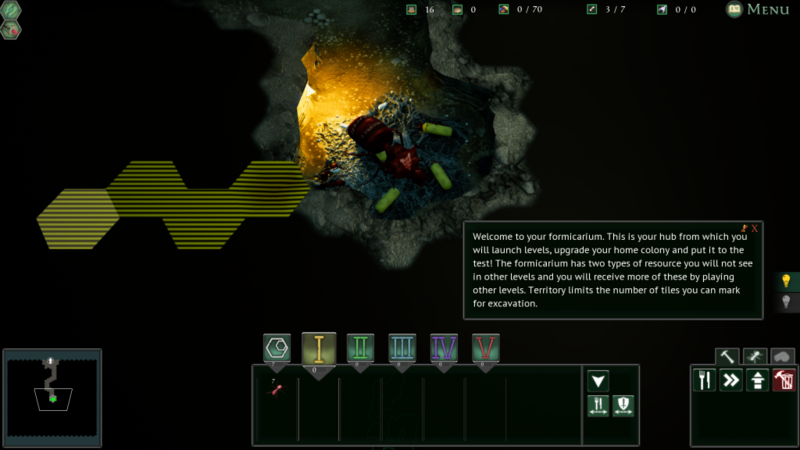 The Formicarium missions are an entirely different beast – as well as lots of careful design choices and scripting to be done, there’s also voice lines that have to be recorded, music that has to be composed, new creatures that have to be designed and implemented, and a long round of balance that has to be done before we can unleash it upon the world. We take some pride in the idea that the missions that exist in the early access build are completed to a high degree of polish; we didn’t want an individual mission to feel half-finished. We will continue this philosophy going forward. 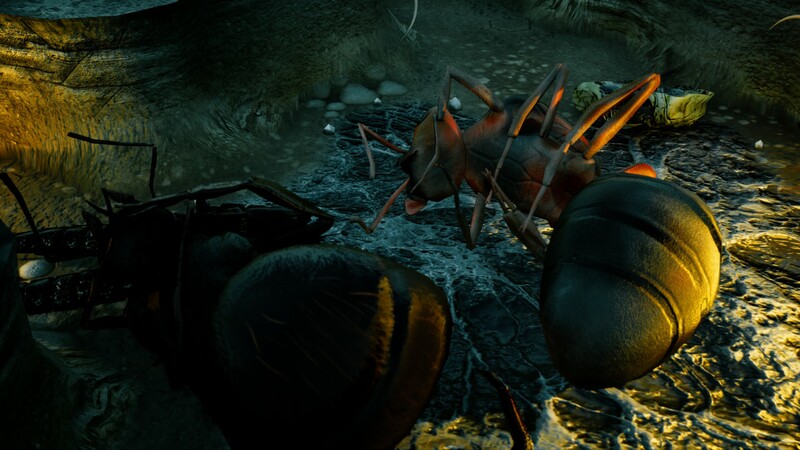 It’s difficult not to get a little emotional when talking about the support you guys have already granted us for our weird little game about invertebrates crawling around in the dirt. Your kind support and encouragement has meant that we have the drive and resources to meet 2018 with a profound sense of optimism in where the project is going. Each and every one of you has been entirely lovely and interacting with you has become a joy. Thanks so much – we really mean it. We cannot launch on Steam today; Launching on itch right NOW! This includes a Steam key that when it does release on Steam next week will allow you to download it from there! We’ve messed up a bit. 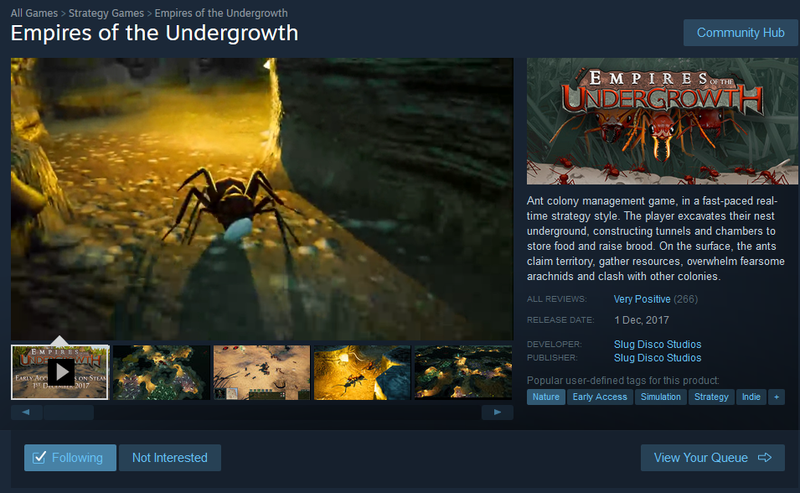 As you’ll no doubt have gathered by the multitude of YouTubers playing the game, Empires of the Undergrowth is ready to go into early access on Steam. Outside of some small intermittent issues, this has been the case for a few days now. We were hoping for a smooth release to Steam and were looking forward to sitting back a little and watching you all play, like proud parents watching their toddlers seeing the snow for the first time. Sadly it didn’t work out quite as idyllically as that (what does?) this time around. And we’re somewhat to blame. Steam has very rigorous standards for the curated set of games that live there. In our haste to prepare EotU for release to the platform, we’ve forgot to set up a few things in our Windows and Mac builds (with some noted irony given the headaches it’s been causing us lately, the Linux build is the only one that passed!) and have therefore run afoul of some rules owing to the UE4 engine we use. Being entirely new to it, we hold our hands up and take the blame – it’s our fault. Unfortunately the way that the review process works, we are unlikely to be able to launch on Steam until next week. So, the question is, what do we do now? The game is ready for early access as far as we’re concerned and we’d love you all to play it as soon as you can. So – we’re going to make the game available through itch.io! This will include a Steam key so when it does finally come out on Steam next week you will also be able to download it from there! We are really sorry about this, this is our first game on Steam and we will learn from this. In the meantime the game is now available on itch.io! 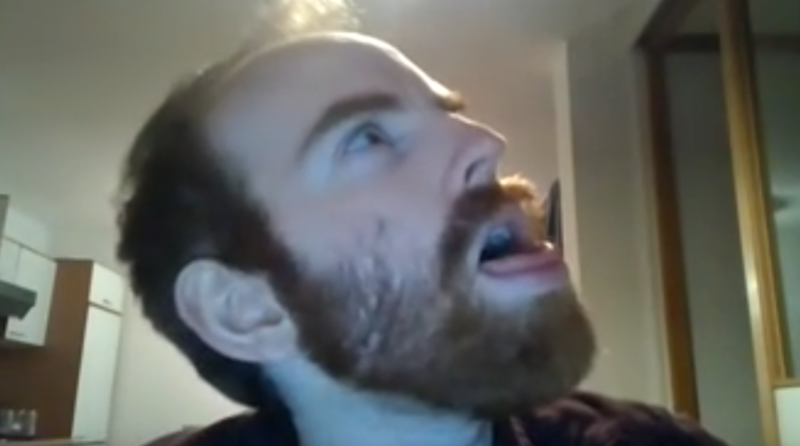 “Ah. I see the queen has taken well to her new home”. Those of you who backed the beta tier of the game on Kickstarter or Paypal – THE BETA HAS BEGUN! Your current Steam copy of the demo will update to become the new beta build. If you backed the beta tier but don’t have a Steam copy of the game yet, please check your emails. A few months back you will have been sent a key to the email associated with your backing method. If you cannot find it, please send us a message and we‘ll do our best to sort it for you. But for now, go and play! We look forward to your feedback on our official forum.